Blue Water Shipping is a global provider of all logistics services in modern supply chain management. With more than 60 offices worldwide, Blue Water combines their strong global network with local expertise to add value and provide clients with services beyond transporting cargo in a safe and efficient way. 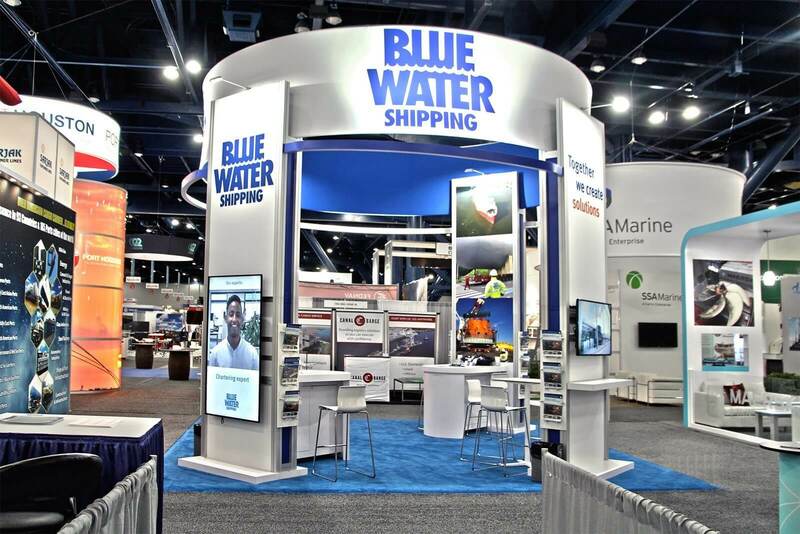 (Source: www.bws.net) Blue Water Shipping came to Exhibit Network with several requirements for their 20 x 20 island booth space: openness, high visibility, video presentation areas, relaxed meeting areas, counter and storage space, color branding, and a place to hold literature. Their primary goals for this event was to educate attendees and share their unique selling point. They also wanted to achieve brand recognition and increase market awareness. Their Denmark office was responsible for making the final decisions. Exhibit Network provided Blue Water Shipping with two preliminary options. The first option featured rectangular towers and panels, and the second option was the Polaris exhibit from our FlexMod Series. Both options satisfied their requirements, but ultimately Blue Water Shipping chose a third option with a circular overhead sign. The sign provided high visibility. The towers provided space for the video monitors, the counters and bar stools provided relaxed meeting areas with storage underneath. The blue carpet emphasized their color branding, and two literature racks were utilized to display their brochures. This exhibit is stored in Exhibit Network’s warehouse and was used again at Breakbulk Americas 2018. Its next appearance will be at Breakbulk Americas 2019 in Houston.